In the summer of 1986, I was travelling in Nicaragua, working on the book of reportage that was published six months later as The Jaguar Smile. It was the seventh anniversary of the Sandinista revolution, and the war against the US-backed Contra forces was intensifying almost daily. I was accompanied by my interpreter, Margarita, an improbably glamorous and high-spirited blonde with more than a passing resemblance to Jayne Mansfield. Our days were filled with evidence of hardship and struggle: the scarcity of produce in the markets of Managua, the bomb crater on a country road where a school bus had been blown up by a Contra mine. One morning, however, Margarita seemed unusually excited. "Bono's coming," she cried, bright-eyed as any fan, and then added, without any change in vocal inflection or dulling of ocular glitter: "Tell me, who is Bono?" In a way, the question was as vivid a demonstration of her country's beleaguered isolation as anything I heard or saw in the frontline villages, the destitute Atlantic Coast bayous or the quake-ravaged city streets. In July 1986, the release of U2's monster album, The Joshua Tree, was still nine months away, but they were already, after all, the masters of War. Who was Bono? He was the fellow who sang: "I can't believe the news today, I can't close my eyes and make it go away." And Nicaragua was one of the places where the news had become unbelievable, and you couldn't shut your eyes to it, and so of course he was there. I didn't meet Bono in Nicaragua, but he did read The Jaguar Smile. Five years later, when I was involved in some difficulties of my own, my friend the composer Michael Berkeley asked if I wanted to go to a U2 Achtung Baby gig, with its hanging psychedelic Trabants. 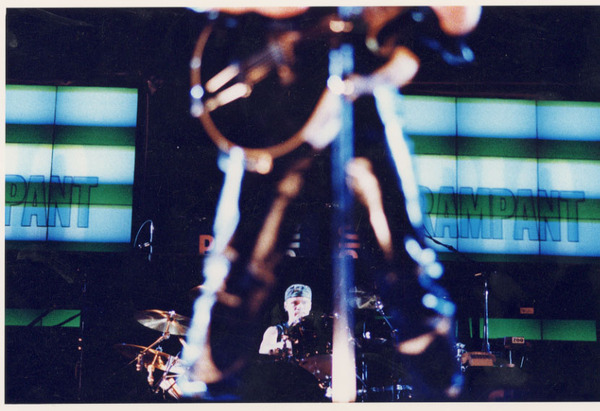 In those days, it was hard for me to go most places, but I said yes, and was touched by the enthusiasm with which the request was greeted by U2's people. And so there I was at Earls Court, standing in the shadows, listening. Backstage, after the show, I was shown into a mobile home full of sandwiches and children. There were no groupies at U2 gigs, just creches. Bono came in, and was instantly festooned with daughters. My memory of that first chat is that I wanted to talk about music and he was keen to talk politics - Nicaragua, a protest against nuclear waste at Sellafield, his support for me and my work. We didn't spend long together, but we both enjoyed it. Two years later, when the Zooropa tour arrived at Wembley Stadium, Bono called to ask if I'd like to come out on stage. U2 wanted to make a gesture of solidarity, and this was the biggest one they could think of. When I told my then 14-year-old son about the plan, he said: "Just don't sing, dad. If you sing, I'll have to kill myself." There was no question of my being allowed to sing - U2 aren't stupid people - but I did go out there and feel, for a moment, what it's like to have 80,000 fans cheering you on. The audience at the average book reading is a little smaller. Girls tend not to climb onto their boyfriends' shoulders, and stage-diving is discouraged. Even at the very best book readings, there are only one or two supermodels dancing by the mixing desk. Anton Corbijn took a photograph that day for which he persuaded Bono and me to exchange glasses. There I am, looking godlike in Bono's wrapround Fly shades, while he peers benignly over my uncool literary specs. There could be no more graphic expression of the difference between our two worlds. It's inevitable that both U2 and I should be criticised for bringing these two worlds together. They have been accused of trying to acquire some borrowed intellectual "cred", and I, of course, am supposedly star-struck. None of this matters very much. I've been crossing frontiers all my life - physical, social, intellectual, artistic borderlines - and I spotted, in Bono and the Edge, whom I've so far come to know better than the others, an equal hunger for the new, for whatever nourishes. I think, too, that the band's involvement in religion - as inescapable a subject in Ireland as it is in India - gave us, when we first met, a subject, and an enemy (fanaticism) in common. An association with U2 is good for one's anecdote stock. Some of these anecdotes are risibly apocryphal. Over the years, U2 and I discussed collaborating on various projects. Bono mentioned an idea he had for a stage musical, but my imagination failed to spark. There was another long Dublin night (a bottle of Jameson's was involved) during which the film director Neil Jordan, Bono and I conspired to make a film of my novel Haroun and the Sea of Stories. To my great regret, this never came to anything, either. Then, in autumn 1999, I published my novel The Ground Beneath Her Feet, in which the Orpheus myth winds through a story set in the world of rock music. Orpheus is the defining myth for both singers and writers - for the Greeks, he was the greatest singer as well as the greatest poet - and it was my Orphic tale that finally made possible the collaboration we'd been kicking around. It happened, like many good things, without being planned. I sent Bono and U2's manager, Paul McGuinness, prepublication copies of the novel, in typescript, hoping that they would tell me if the thing worked or not. Bono said afterwards that he had been worried on my behalf, believing that I had taken on an impossible task, and that he began reading the book in the spirit of a "policeman" - that is, to save me from my mistakes. Fortunately, the novel passed the test. Deep inside it is the lyric of what Bono called the novel's "title track", a sad elegy written by the main male character about the woman he loved, who has been swallowed up in an earthquake: a contemporary Orpheus's lament for his lost Eurydice. Bono called me. "I've written this melody for your words, and I think it might be one of the best things I've done." I was astonished. One of the novel's principal images is that of the permeable frontier between the world of the imagination and the one we inhabit, and here was an imaginary song crossing that frontier. I went to McGuinness's place near Dublin to hear it. Bono played the demo CD to me in his car. Only when he was sure that I liked it - and I liked it right away - did we go back indoors and play it for the assembled company. There wasn't much, after that, that one would properly call "collaboration". There was a long afternoon when Daniel Lanois, who was producing the song, brought his guitar and sat down with me to work out the lyrical structure. And there was the Day of the Lost Words, when I was called urgently by a woman from Principle Management, who look after U2. "They're in the studio and they can't find the lyrics. Could you fax them over?" Otherwise, silence, until the song was ready. I wasn't expecting it to happen, but I'm proud of it. For U2, too, it was a departure. They haven't often used anyone's lyrics but their own, and they don't usually start with the lyrics: typically, the words come at the very end. But somehow it all worked out. I suggested facetiously that they might consider renaming the band U2+1, or, even better, Me2, but I think they'd heard all those gags before. There was a long alfresco lunch in Killiney, at which the film director Wim Wenders startlingly announced that artists must no longer use irony. Plain speaking, he argued, was necessary now: communication should be direct, and anything that might create confusion should be eschewed. Irony, in the rock world, has acquired a special meaning. The multimedia self-consciousness of U2's Achtung Baby/Zooropa phase, which simultaneously embraced and debunked the mythology and gobbledegook of rock stardom, capitalism and power, and of which Bono's white-faced, gold-lamé-suited, red-velvet-horned MacPhisto incarnation was the emblem, is what Wenders was criticising. Characteristically, U2 responded by taking this approach further, pushing it further than it would bear, on the less well-received PopMart tour. After that, it seems, they took Wenders's advice. The new album, and the Elevation tour, is the spare, impressive result. There was a lot riding on this album, this tour. If things hadn't gone well, it might have been the end of U2. They certainly discussed that possibility, and the album was much delayed as they agonised over it. Extracurricular activities (mainly Bono's) also slowed them down, but since these included getting David Trimble and John Hume to shake hands on a public stage, and reducing Senator Jesse Helms - Jesse Helms! - to tears, winning his support for the campaign against Third World debt, it's hard to argue that these were self-indulgent irrelevances. At any event, All That You Can't Leave Behind turned out to be a strong album, a renewal of creative force, and, as Bono put it, there's a lot of goodwill flowing towards the band right now. I've seen them three times this year: in the "secret" pretour gig in London's Astoria theatre, and twice in America, in San Diego and Anaheim. They've come out of the stadiums to play arena-sized venues that seem tiny after the gigantism of their recent past. The act has been stripped bare; essentially, it's just the four of them, playing their instruments and singing their songs. For a person of my age, who remembers when rock music was always like this, the show feels simultaneously nostalgic and innovative. In the age of choreographed, instrument-less little-boy and little-girl bands (I know the Supremes didn't play guitars, but they were the Supremes), it's exhilarating to watch a great grown-up quartet do the fine, simple things so well. Direct communication, as Wim Wenders said. It works. And they're playing my song. Read the whole of Salman Rushdie's story at : The Sunday Times.